Nutri-Grain Bars and Rice Krispies Treats only $0.79 a Box after Gift Card! Target is running a promo right now where you'll get a $5 Target gift card when you buy 5 select Kellogg's products. 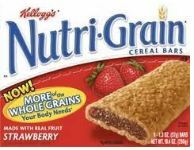 Using a few coupons, you can get a great deal on Nutri-Grain bars and Rice Krispies Treats! = $3.97 for 5 products or approximately $0.79 cents each! If you'd rather, you can get only Nutri-Grain Bars with this deal. Buy 5 and use 2 of each coupon and they'll come out to just $0.70 a box!